If you’re planning on going hunting during the coming season, then it’s time you make your game plan and make sure you have all the necessities and equipment to catch your prey. Many skilled hunters climb trees to have a more strategic angle that makes it easier to shoot and with more discretion from their prey. But hunters don’t just climb and sit on branches. They build tree stands to support themselves while they stay and wait adequately. While there is readymade tree stands available, you can save money and build one yourself. 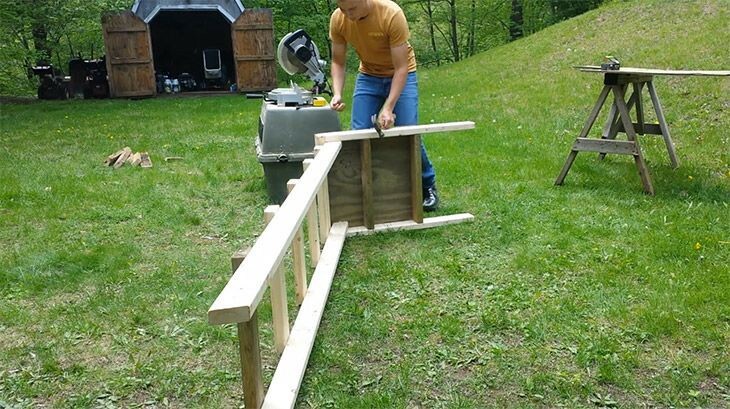 But you’re probably wondering how to build a tree stand in the first place. So read on as I will show you the easy steps on how to build a tree stand and some tips on staying safe while hunting from above. What is a Tree Stand? 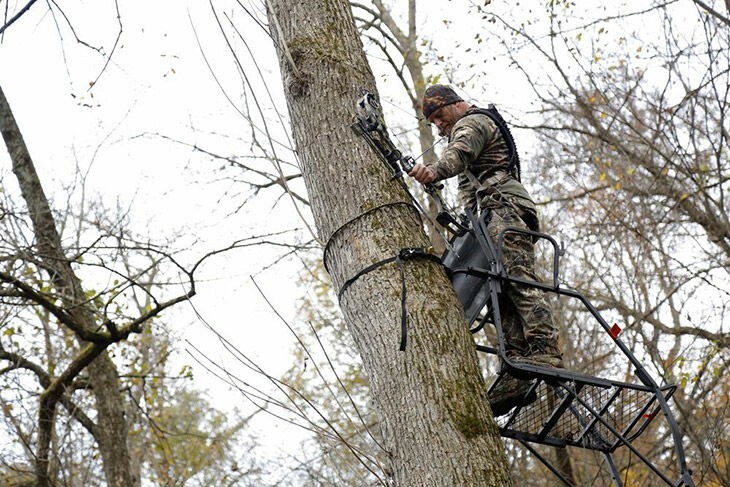 You’ve probably wondered about how hunters love climbing trees to capture their bucks, but how do they stay up there without the risk of falling and injuring themselves. That’s because they have tree stands, a human-made corner that enables them to remain above ground for a few hours, getting a wider and open view of the fields for you to quickly acquire a target and take your aim without being too conspicuous. Because you’re at the top on your the stand, you aren’t only supported with a great view, but you’re high enough to stay undetected, where animals can’t smell or see you. There are many types of tree stands available, depending on your preference. 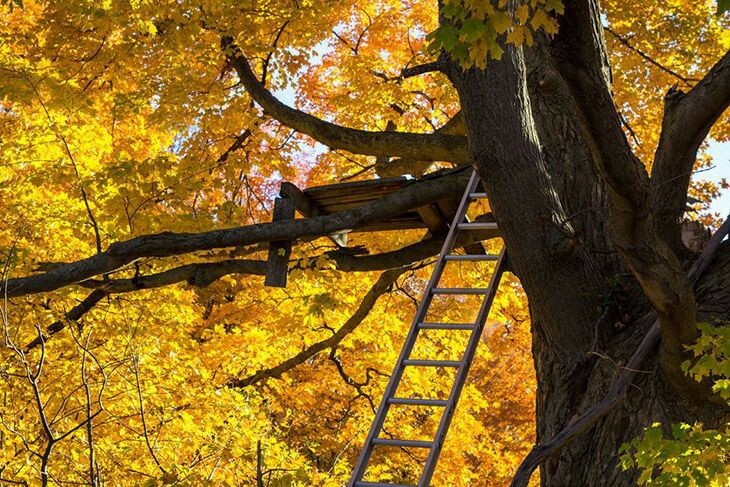 There is the ladder stand (an immovable kind), the lock-on stand (safe and light to use, using screws), and the climber stand (best for bowhunters, portable and easy to install on any tree). 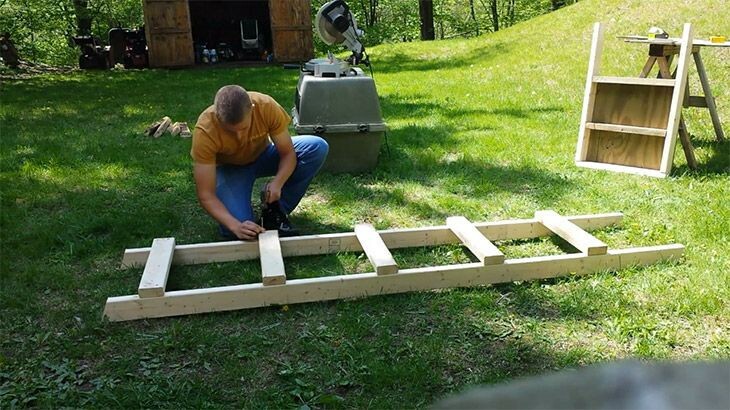 In this article, we’ll be creating a ladder tree stand you can either sit or stand on, coming with a ladder for easy access. Lay the two wood beams next to each other, making sure that both of them have the accurate measurements. The two-inch thickness should be facing up. Once you have prepared the wooden beams, the next step is to cut the rings for the ladder. With the extra wood beams, cut 14 pieces that measure about two feet. Place the rungs on the wood beams in a way that the rungs are about 20 inches apart (vertically). Fasten the rungs with the screws and screwdriver. Before anything else, you’ll need to choose the tree where you’ll be building the tree stand on. Make sure that you pick the right tree, the one that is straight and tall without too many branches, as this will be difficult to climb to. The tree should be perpendicularly downwind and away from the traveling direction of animals to stay discreet. It should have a proper width and enough leaves to cover you, about 20 yards away from the hunting area as well (if you are bowhunting). Now that you have a tree to build the stand, look for two sturdy branches that are parallel to each other. Cut two pieces of wood from the extra wood means, measuring 2.5 feet in length. Nail both of these pieces to the branch, hammering it until it’s nailed in without chances of it falling. Nail the plywood on the wood boards. You can also add two more extra 2x4-inch beams underneath the platform, nailing it diagonally to the tree trunk for better support. With another two extra wood beams, nail it to the top of the ladder, perpendicular to the rungs. Screw the connecting wood beams underneath the platform and fasten it to the plywood. Now, climb the tree to the stand (with a safety harness) and test it out, making sure that it’s sturdy and supportive enough to hold your weight. If you feel like some parts are loose, then screw or nail them down better, ensuring that the branches are sturdy to hold both the tree stand and your weight. And you’re done! You now have a tree stand for sitting or standing. You can also add some safety features such as railings to hold on to so you have something to catch you around the sides if ever you take the wrong step. Now that you know how to build a tree stand, the next question is: How will you be about to hunt while on the tree properly? For beginners, it may seem a bit of a challenge because of the new angles and other factors to consider as compared to hunting on the ground. But once you get used to it and practice, you’ll be able to correctly set up and get yourself the prey you’ve been eyeing. When climbing your trees hand, make sure that you take heed and be careful while getting up to avoid falling or sustaining any injuries. Same goes for climbing down. Once you hit your target, do NOT hurry up and excite yourself going down. Take it slow rather than panic and rush. Invest in a safety harness for prevention of injuries and worst case scenarios. You’ll need to be knowledgeable on how you can rescue yourself in case you do fall. Select a firm and durable harness so you can straighten yourself up just in case. Also, carry a phone if you are alone in case you will need help getting down from your tree stand. Acquaint yourself with the area around you, especially the tree you chose to build the tree stand. Care for the tree and check for any possibilities of branches or wood falling. Hunting isn’t only on the ground, but you can target and aim up in the sky as well for a more efficient and discreet way to capture the big buck! With a tree stand to support your weight, you’ll be able to hone your hunting skills while getting the best out of your hunting session in the fields. I hope that this article on how to build a tree stand helped you become more knowledgeable about what you need to know about hunting when on trees and what you can do to build the sturdy and reliable tree stand to keep you up and discreet while hunting. So what are you waiting for? If you want a tree stand, then create an inexpensive and reliable one today! If you have any questions or would like to share your experiences on creating tree stands, then comment down below. I would love to hear what you have to think. Originally published at muskethunting.com on December 20, 2017.